Article paru dans le Scotsman du 5 juin 2012 ! UNLIKE the presidential election and its 80 per cent turnout, which led Socialist candidate François Hollande to victory last month, the parliamentary elections next Sunday have triggered a much lower public interest. However, exception can be made for the small northern constituency of Henin-Beaumont, near Lille. The traditional Parti Socialiste vs right-wing UMP divide has been replaced by a much more peculiar Front vs Front battle. The unemployment-stricken constituency was a coal-mining area and used to be a communist stronghold. But many voters have progressively shifted towards the far right in the past few years. The history of Henin-Beaumont is only one piece of the puzzle. The dramatic shrinking of votes for the traditional left among French working-class voters in the past 30 years should be considered as well. It has been seen as an expression of protest against mainstream parties, who are seen as incapable of addressing their concerns. A feeling of threat from a whole economic and political system is also beginning to spread among some of the least privileged citizens. Marine Le Pen and Jean-Luc Mélenchon, despite their total opposition on many issues, have this one thing in common: they want more protection. Both are protesting against a deregulated capitalist system which has led the world to a crisis where the most disadvantaged are hit the hardest. But whereas Mélenchon wants more solidarity in Europe, more social security and trade protectionism around European borders, Le Pen wants to leave the EU, come back to the former French currency and close the borders. The core difference is that Le Pen is fighting anything coming from “the outside”: the financial crisis, European treaties, immigration, and her new obsession, Islam. Whereas her ideas were thought extremist a few years ago, they have become rather mainstream. 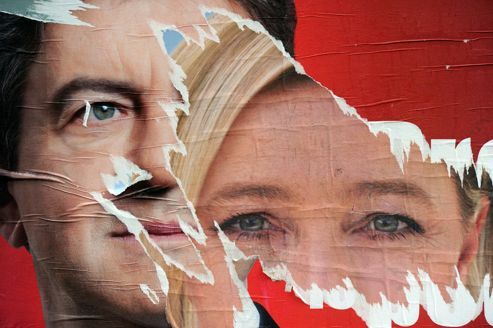 In a recent poll, 51 per cent considered the Front National a mainstream party. Next Post World Environment Day: what are we doing to save the planet?